Habitat : Throughout india, in semi-green and moist deciduous forests. 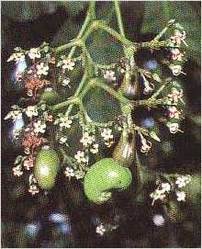 Uses : The fruits are acrid, bitter, astringent, digestive, carminative, purgative, liver tonic, expectorant, stomachic, laxative, tonic and oleaginous. The fruit is useful in leucoderma, scaly skin, allergic, dermatitis, poisonous bites, leprosy, cough, asthma, and dyspepsia. Also act as insecticides, antiseptic, termite repellents and herbicide. It is extremely beneficial in the diseases like piles, colitis, diarrhea, dyspepsia, ascites, tumours and worms. The topical application of its oil on swollen joints and traumatic wounds effectively controls the pain.